This term pupils in P4n and P4s have been learning all about Fishing. They have been lucky enough to tour a pelagic fishing boat the ‘Antarctic ll’ and had a visit from Frankie’s Fish and Chip shop to help them understand the journey of fish from the sea to their plate and making them aware of the richness around our island. With excellent support from Izzy Swanson the pupils brought their topic to life with a special play, which they performed to their parents/carers last week. ‘One from the Sea, Three from the Land’ was written especially for the class by Izzy Swanson and brings together stories of old folklore and dialect singing. P6 have been delighted to welcome Field Studies Advisor Mr Rose to Bell’s Brae this term as part of our “Light & Sound” science topic. He has shown P6s several experiments and we have learned lots of interesting facts. Thank you, Mr Rose! Pupils in P2 entertained parents/carers and family members this afternoon with their performance of ‘There’s a sunflower in my supper’. Their colourful, well rehearsed, fun and engaging performance was enjoyed by all. Through it they evidenced how hard they had worked, the knowledge they had gained and their many skills and abilities. They were certainly successful learners, confident individuals and responsible citizens. They should all be really proud of themselves. 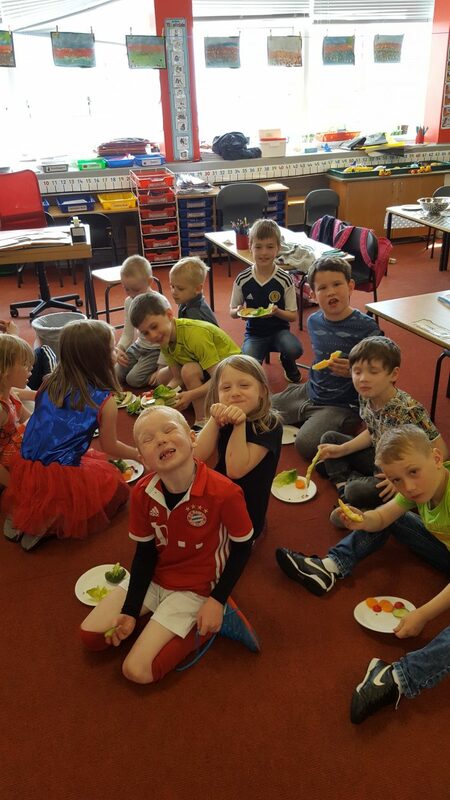 This term P2n have been learning all about growing things. Today they shared their learning with P1-4 at assembly. They were certainly confident individuals as they all spoke clearly to their peers. We were all able to see and hear how much they have enjoyed their learning this term. We saw their skills in listening and talking, reading, writing, singing, drawing, creating, singing and presenting. They have carried out experiments and enjoyed being scientists. On Friday at Assembly the pupils from Primary 4s shared their learning with the pupils from Primary 4-7. They did an excellent presentation about Living Things sharing all the facts they had learned. They involved the audience too! They finished the Assembly with a wonderful song sung entirely in French! It was lovely to see them all enjoying their learning and having the confidence to share it with their peers! In Primary 2s they have been looking at different parts of a plant as part of their Growth Topic. 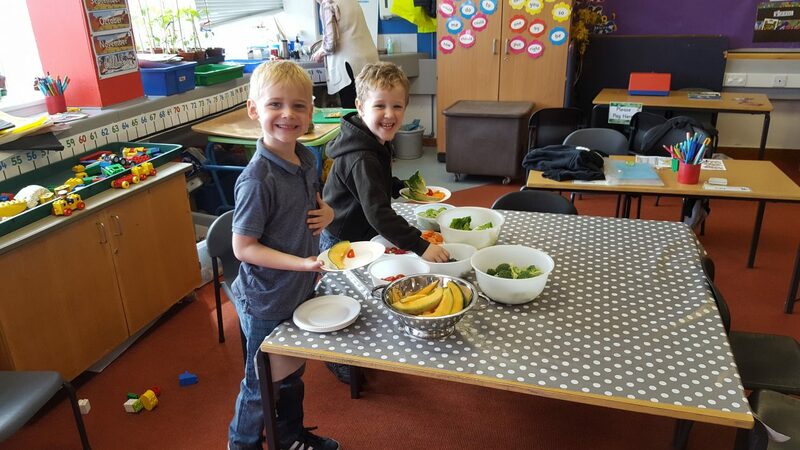 The children had to figure out what part of the plant they were looking at and then they prepared the vegetables and fruit and had a salad bar where they got to choose what they would like to eat. 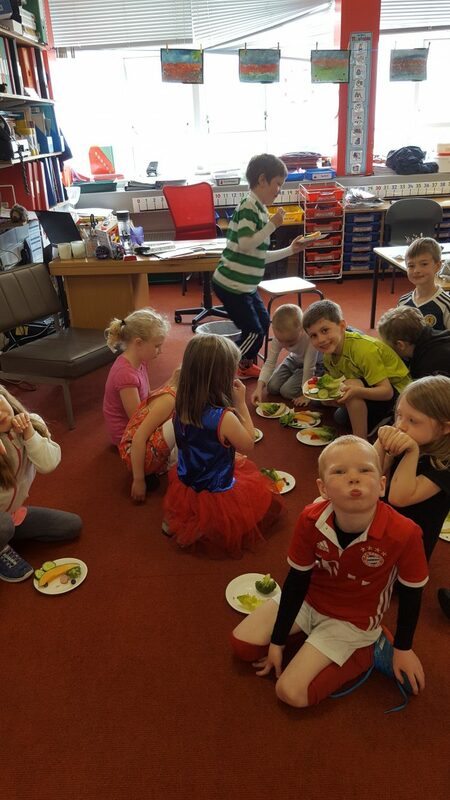 They will be writing up their salad recipes next week. On Friday the P7s class entertained pupils from P4-7 with their climate change assembly. This was presented in a fun and interesting way with the pupils deciding themselves how to present key information. They shared interesting facts in the form of a ‘Who wants to be a millionaire’ quiz and made suggestions for how the audience can make a difference. All of the spoke with confidence and in nice clear voices. Today we went to Burradale and saw some windmills. I found some of the facts interesting it was really good fun! I learnt the ladder inside the turbine was 45metres high and it was so tall you needed a harness to get up there but unfortunately we couldn’t go up!awwww! There was 5 turbines and Mrs Moore, Mrs Byrll, Mrs Stuart and Miss Anderson came to help! We also played games on the Bus!